With impressive views over Hyde Park, a Michelin-starred restaurant and an innovative spa, the flagship Hilton hotel promises high living, luxury dining and true relaxation. The Hilton's flagship hotel lives up to its Park Lane address. 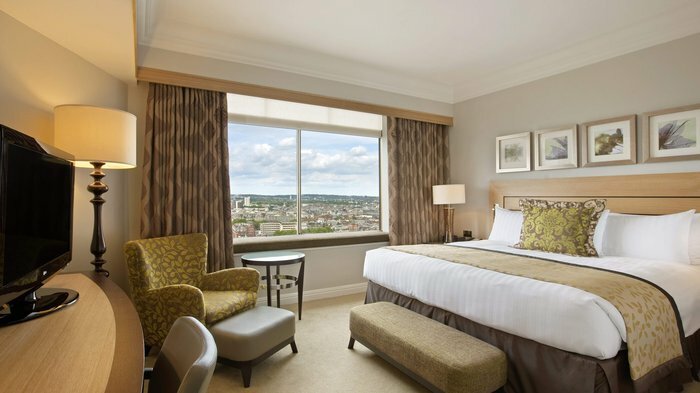 The Hilton's flagship property, this impressive hotel commands lovely views over Hyde Park and London's cityscape. This place has got to live up to its Park Lane address so expect slick service and high-living. After a busy day of testing your credit card limit on Bond Street, the Hilton's 28th floor boasts Galvin at Windows for cocktails, Michelin-starred French cuisine and unrivalled views. For those looking to do something a little more fun, try the Chocolate Afternoon Tea, full of delightful treats such as scones, cupcakes and chocolate miniature fancies. Stepping out of the hotel, Hyde Park is right on your doorstep, while London's theatres, museums and galleries are all just a short distance away. Enjoy traditional French cuisine and spectacular views at this Michelin-starred restaurant. This relaxed restaurant serves the renowned Hilton breakfast and a chocolate afternoon tea. As well as the renowned Hilton breakfast, the Podium Restaurant and Bar, housed within the London Hilton on Park Lane, serves lunch, afternoon tea and dinner. Based around European cuisine, the menu features a number of classics and has something for everyone. The star of the show, however, is the Confessions of a Chocoholic Afternoon Tea. As the name suggests, it takes a chocolate-themed twist on the sweet tradition. With a theme based on Pop Art greats like Andy Warhol and Roy Lichtenstein, it serves up chocolate chip scones with chocolate praline spread, cupcakes and miniature fancies displayed on an edible chocolate plate. The renowned celeb hotspot reopened in 2014 with a bran-new look. London's renowned celebrity hotspot - a favourite haunt for every class of celeb from footballers to royals - returns in 2014 after an extensive two-month refurbishment. The new Whisky Mist has been overseen by nightclub owner Nick House (who is also co-owner of Mahiki and Bodo's Schloss) and a team from top clubs in Europe to reveal "a darkly glamorous new spin on its Scottish heritage". Clubbers can dance till dawn in rooms decorated with suits of armour, coats of arms, crested wallpaper, whisky barrels and the majestic stag after which the club is named. The "gothic chapel" look is completed by stained glass windows, a reclaimed church organ and pews. Cocktails are served in pewter and steel, and leather and horn cups. Opt for the signature Whisky Mist cocktail and you'll get a potent alcoholic drink infused with amber and honey. With the return of Whisky Mist comes its new sister club, Rusty Nail, an intimate, exclusive late-night hangout with a carefully curated line-up of DJs which is, presumably, for VVIPs and is also available for private hire. London's first Polynesian-themed restaurant and the inventors of the Mai Tai. Hidden with the Hilton on Park Lane is the surreal world of Trader Vic's, London's first Polynesian-themed restaurant. Opened in 1963, 29 years after Vic "The Trader" Bergeron opened his little saloon Hinky Dinks in California, the restaurant has become a London institution and draws on the French, Oriental and American influences of Polynesian heritage. Further to the food, guests can enjoy a range of cocktails, including the Mai Tai, which Vic invented in California back in 1944, and the London Sour, created in honour of the restaurant's opening. Try the Hollywood favourite Japanese Nightingale Dropping Facial at this innovative spa. Home to the Hollywood favourite Japanese Nightingale Dropping Facial, the team at Spa to You aren't lying when they claim to 'offer the latest techniques in global spa treatments'. Found on the lower ground floor of the Hilton on Park Lane, the spa certainly offers a diverse range of treatments; as well as the aforementioned ' bird poo' facial, the treatment menu also features Swedish, Thai, Chinese and Polynesian massages, as well as treatments that feature tiger clam shells and bamboo canes. From cheap budget places to stay to luxury 5 star hotels see our deals for hotels, including DoubleTree by Hilton Hotel London - ExCel from 62% off.